Info "Don’t let dinner get away!" Catch of the Day is one of Dribble and Spitz's Microgames in WarioWare: Smooth Moves. 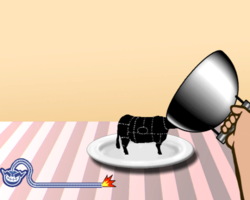 The objective is to wait for the animal to get onto the plate, and then firmly plant the Wii Remote down to close it. 1st level difficulty: The player has to catch one cow. 2nd level difficulty: The player has to catch a fish. The fish moves so the player must time it right. 3rd level difficulty: The player has to catch a living sausage, a living onion and a living potato. The player will have to wait for all of them to be on. This page was last edited on February 20, 2018, at 15:32.